From the creators of Meet the Inkies Pet Paradise, comes another wonderful fingerprinting activity book the kids are going to love. Fingerprint Art Space by Lake Press is filled with alien themed activities for the kids to complete, with step-by-step instructions on how to create funky fingerprint aliens, planets to decorate and scenes to fill in with your own creations. With a little more guidance and instruction throughout, kids who need a bit more creative inspiration will really like how this one steps them through the activities. The inkpad down the side of the book has six super bright colours for the kids to use (and comes with a cover), and just like with Meet the Inkies Pet Paradise, the ink will outlast the activities, so the kids can take what they learn from the book and continue making awesome alien creatures. This is another great activity book that will spark creative wonder and inspire the kids to explore a different and super fun way of drawing. There are also other books in this series to choose from, so if the kids don’t like spacey things, they can choose dinosaur, animal or fairy tale themed books. 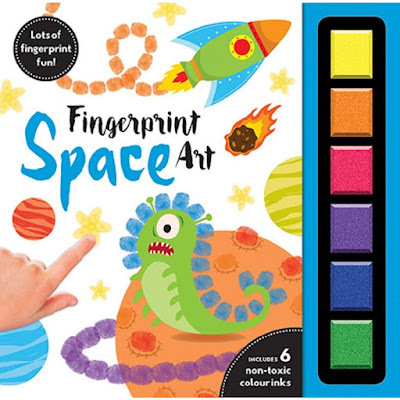 A fabulous activity book for the holidays, a gift or even just a rainy day, Fingerprint Art Space is fantastic fun for kids aged four and up.